There are only so many ways a Russian company can make its performance look better to the markets without resorting to magic tricks. Ed Balducci was a well-known American magician, but he died long before Oleg Deripaska, the current chief executive of the Russian aluminium monopoly Rusal, owned anything of significance. Ed’s famous trick, known as the Balducci Levitation, goes like this: the magician lifts his arms by his sides and his feet appear slowly to rise a few centimetres off the ground, before they return to earth. The illusion is managed by placing the audience within 3 meters of the performer, and at a 45-degree angle of view. It is the restrictive angle which does the trick. “Readers will be aware that there was some excitement in this column earlier in the week at the prospect that the Russian aluminium stock Rusal might finally close above HK$10.80 for the first time this year, the price at which it was listed. It spent half of Monday in this rarefied zone before slumping back to $1.70 by the close. Turnover had rocketed to HK$245 million compared with a range of HK$4-HK75 million in the preceding weeks. We had assumed that its advance was due to increasing enthusiasm for the stock. “However it appears this thought was misplaced. Rusal was taken off the list of designated short selling stocks at the end of October, thereby reducing the number of short sellers. At the same time commodities worldwide were lifted by news of the a second round of quantitative easing by the US and those holding short positions began to feel vulnerable and scrambled to buyback the stock thereby creating a classic short squeeze which pushed up the stock price sharply. In fact, by the close of Friday trading in Hong Kong, Rusal was down 6% to HK$9.96. From the start of trading, the Hong Kong exchange has done its best to protect the Rusal share price from negative sentiment and falling price. Without explaining what it was doing, or why, between January 27 and March 25, the exchange did not allow short-selling of Rusal shares at all. This prevented anyone betting on the fall of the Rusal share price. A popular combination for share traders – betting on the rise of the aluminium metal price, but covering the bet with a wager that Rusal would fall if aluminium went down – was prohibited while this restriction was in place. Despite this, the Rusal share price collapsed 31% in the first weeks of trading. The exchange spokesman, Scott Sapp, explained that one in three of the exchange-traded stocks was allowed for short-selling, but in March he refused to acknowledge the reason for the short-selling ban for Rusal, nor say why the ban was lifted in late March. Yesterday, the exchange issued a press release saying that “with effect from 15 November 2010 (Monday), United Company RUSAL Plc (Stock code: 486) will be admitted to the list of designated securities eligible for short selling.” No explanation for the delisting or the restoration. Rusal’s website presentation of the new financial report makes it difficult to spot the downturn that has occurred between the second and third quarters. Instead, the company highlights nine-month results for 2010 and compares them to the 9-month period of 2009. Another Balducci levitation trick by angling the perspective. The small print in the Rusal release reports the company’s cost of sales reached $5,456 million, an increase of 10.8%; of which energy costs are reported to be $1,453 million, up 4.4%. But this comparison is with the 9-month period of 2009. If you look closely at the 3rd quarter costs, and compare them with the third quarter of 2009, the picture is much worse. Rusal admits that costs in the latest quarter came to $1,961 million. That was up 33% since last year. 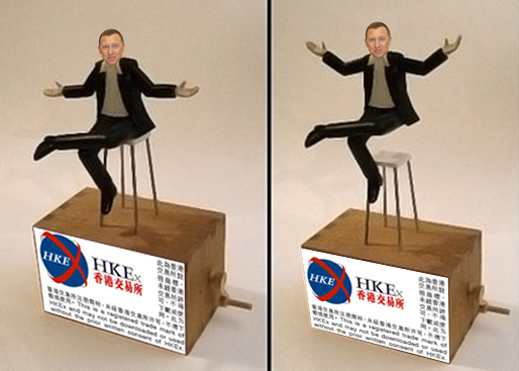 The reason for the reluctance to broadcast the 33% increase in costs is that Deripaska is trying to list his electricity company, Eurosibenergo, on the Hong Kong exchange. To succeed at that, he needs to explain to potential share-buyers into which of his pockets he intends to put his profits, and into which his losses – Rusal or Eurosibenergo. Since this report was published, Deripaska’s financial advisors have been forced to lower their valuation of Eurosibenergo by 25%, and cut their target for the initial public offering from $2 billion to $1.5 billion. And this is before the prospectus has been released. Investors may scratch their heads over who gains, Rusal or Eurosibenerego, from these so-called “embedded derivatives”. Rusal spokesman Vera Kurochkina refuses to answer questions from reporters on the company black-list. Kurochkina herself has been gaining in spending money, and since her promotion to the Rusal board of directors, personal compensation. The quarter-on-quarter financial data reveal that Rusal’s press, investor relations and lobbying bills, for which Kuroochkina is responsible, have ballooned, as the cost of promotion rises to hold back the tide of scepticism. Administrative expenses for Rusal, according to today’s report, came to $172 million in the September quarter, up 25% since a year ago; up 12% since this year’s second quarter. Rusal’s profit line has also been shrinking significantly over the past quarter. Before tax, the quarterly profit was in fact a loss of $3 million. The after-tax profit line was also down — by 97% compared to the second quarter of this year. It would have been worse if not for a tax credit of $32 million. There is no report of why Rusal received this. The company’s profitability as measured by its operating margin and its net margin was significantly less in the latest period compared to the June quarter.